These four things are essential to finding the flight that gets you to your destination without blowing your budget and are all equally important. This may sound simple, there is an airport right down the road, but be careful as that may not be the best option. Not everyone has the luxury of choice, but some do. You need to consider whether you are willing to drive a bit to get to an airport and see what the options are. For some flights it really doesn’t matter, but others you may pay double or more to fly from the one closest to you, so it pays to look around a bit. We live in New York state with a small international airport nearby and have family or friends in many major nearby cities, including NYC. The airports in NYC tend to be substantially less expensive for most (but not all) international flights. We tend to turn these trips into visits, taking a couple days to recover at their houses at the end of the trip. This also gives us free parking, which can be substantial. You also can sometimes park in an airport hotel (if you stay a night) or a park and ride near the airport and get a ride from there to save on cost. Remember, you don’t always have to fly in and out of the same city. This can allow you to see more with the time you have and sometimes even saves some money. You also don’t always have to book a round trip ticket. For Peru we flew to Lima with one airline, had a round trip flight from Lima to Cusco with a second airline, and flew home with a third airline. It worked better for our schedule and budget. Flights for a specific trip - Just like where you fly out of, where you fly into is important too. Check other airports nearby. If we have a hard time finding a good flight we may even go as crazy as splitting the trip up or adding a destination. There are many hubs in Europe that are easy to get to and from them you can go just about anywhere on the continent with a budget airline. For example, when we were trying to find a flight back from Barcelona all of them had crazy layovers so we checked out where the layovers were. The most common one was Norway, so we checked out flights to Norway and Norway to NY. It ended up being much less for these two direct flights, we got a couple days in another country that we wanted to see anyways, and we didn’t have to deal with a 12 hour layover! Flights when you haven’t settled on a destination - I always have a running list of places I want to go, which is pretty much everywhere, and sometimes we can really use this to our advantage. When we went to Singapore, Thailand, and Malaysia, our only set destination was a conference in Singapore. I looked at what was nearby and what direct flights were available and used that to plan our itinerary. Using the Map Method on Google Flights (see below) can work great for playing around with this. The more flexibility you have on this the better. I usually pick a month and get my bosses blessing for the general time frame before I get tickets, then once I buy tickets I request the actual days. Most all flights are free to cancel within 24 hours anyways. One week to the next can make all the difference and even leaving a day or two earlier or later. See below for some search tips. The Map Method works really well if you are flexible. It depends. Budget airline often have great prices but charge more for baggage and extras so I always do the math to see whether it makes sense. Otherwise the flight amenities tend to be very basic, but that is usually ok for an hour or two. 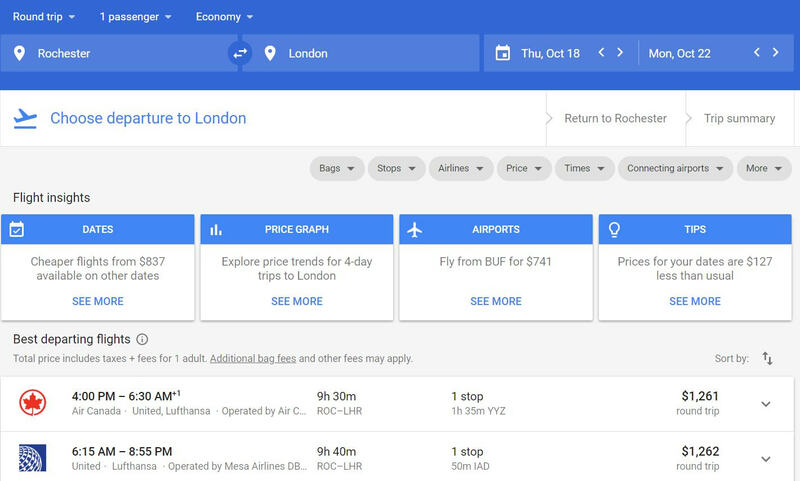 Google Flights is my go-to search right now because it is so powerful, but some airlines (like Southwest) still don’t show up, so it doesn’t hurt to check other places too. 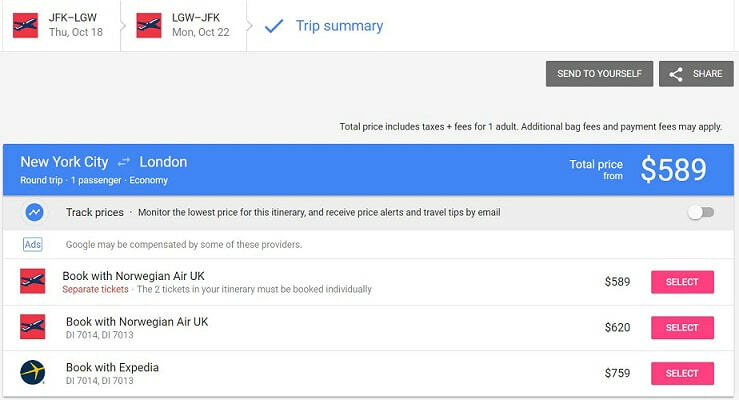 Google flights doesn’t always capture all the taxes and fees, so be careful. If the price changes when you go to purchase the ticket this may be why. 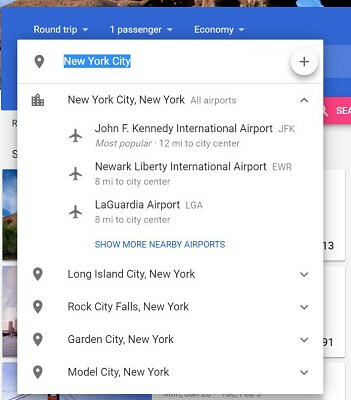 When you go to https://www.google.com/flights/ you will have two options, Text Search (traditional fligth search with tips) or Map Search (for flexible trips and exploring destination options). The first question you will be asked is where you want to fly in and out of. For both of there fields you have the option of clicking the + to add multiple cities or just searching for one at a time. You can also choose one-way flights and multiple destinations (such as flying into one airport and out of another). Sometimes booking flights separately works better, but often there is a discount for a round-trip even if it is multiple airports. You can play around and keep hitting the plus to add as many flights as you want. Next you will need to enter the dates. Here you can scroll though the days and try out a number of combinations to find the best flights and prices. Some days may have similar prices but through different airline, have different layovers, or less stops. Once you pick the airports and the dates Google will try to give you some suggestions. Above the suggestions is a row of dropdown menus that you can use to filter the list of results further by how many stops, when you want to fly, etc. You can also change what they sort by using the arrow just above the flights on the right. If you click one of the “Flight insights” Google will provide you with some more information. I find that the Airports one can be useful. It shows you a nice map of where other airports are and the price differences for the days you have selected. You can toggle between “Origin airports” and “Destination airports” with the dropdown in the upper left corner. To see more about the flight click the arrow on the right or to select the flight just click on the flight. Do the same for the return flight. Once the flights are selected you will get to choose what to do next. You can choose to purchase it now from any of their suggested sources or go and search for the flight on your own. You can also choose to wait and send the info to yourself or someone else. They also allow you to track the price of the flights. This works, can be setup to e-mail you when the price changes, and you can track many all at once. The downside is that this may factor into the advertising algorithms and change the price because they know you are watching. This works great if you are open on your destination or your date. You can put in your airport and search the globe for specific dates or tell it to look for trips of a particular length of time or a general month. You can zoom in and out anywhere you want. Most major airports will have a price pop up automatically when you zoom in. Smaller airports will require you to click on them before doing a search. All of these will give you options for the best dates to fly when you click on them accompanied by how many stops and total time. 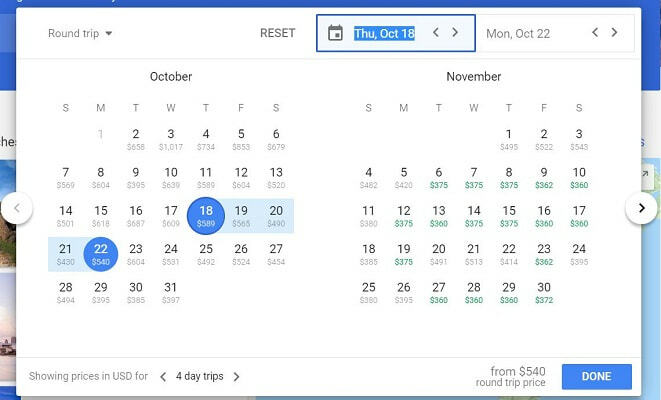 You can also use the dropdown menus in the top right corner to only show preferred airlines or a limited number of stops. The options with this seem limitless and you may end up somewhere you never imagined. Tip 1 - If you don’t like what you find remember that prices and options change daily. Look again tomorrow. Wendover has a great video on this and many others about the economics of airlines. Tip 2 - Remember that sites like Expedia sometimes buy up blocks of tickets, so it doesn’t hurt searching their site too. Sometimes they don’t show up on Google Flights. Tip 3 - Some credit cards provide basic travel insurance, so you may want to see what your cards offer before you pay.